They aren't perfect, but they are my attempt at the world of virtual cards. These are the Celebrity Rookie Cards. 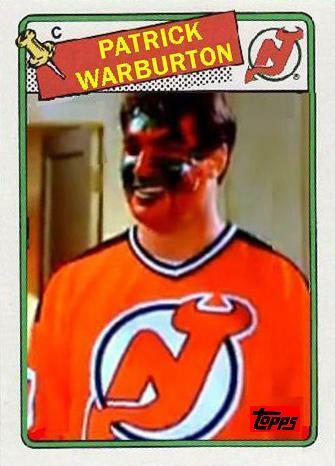 I have been a fan of Patrick Warburton from his time on News Radio. His episode as a face-painted fan of the Devils on Seinfeld was classic and earned him a Celebrity Rookie Card. Mariah Carey showed her fondness for MJ by wearing a Wizards jersey-dress at the 2003 NBA all-star game. The Wizards were the Bullets when Carey debuted, but I opted for the Wizards card to keep continuity. Celebrity Rookie Card, damn it!!! And to think we even made you an honorary EZland ELF!!! Always good to hear from you. I'd love (LOVE, LOVE) to do an EZ Celebrity rookie card. However, I do not recall seeing any pictures of yourself in a sports jersey. Being an honorary EZ elf was one of the highlights of 2009 for me. Nice job! I've been a big fan of Warburton's too. Sometimes it seems like I'm the only Newsradio fan out there. Glad to see there's another!